The David Hayes-led Lindsay Park stable are tipped to go back-to-back in the Group 1 $1.5 million Ladbrokes Blue Diamond Stakes (1200m) this weekend with their undefeated colt Long Leaf continuing to firm as favourite for the two-years-old classic. Lindsay Park’s undefeated colt Long Leaf is firming favourite in Ladbrokes Blue Diamond Stakes 2018 betting for this weekend. Photo: Ultimate Racing Photos. Last Melbourne Autumn Racing Carnival the team took out Victoria’s premier race for juveniles with gun filly Catchy and twelve months on they return with a four-strong contingent. Hall of Famer Hayes now trains in partnership with his son Ben and nephew Tom Dabernig. After having also previously prepared five Blue Diamond Stakes winners on his own before the 2017 success of Catchy, the master horseman is now after a seventh trophy on Saturday at Caulfield Racecourse. 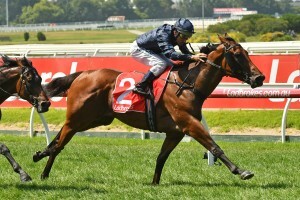 The best fancied of the Lindsay Park hopefuls and favourite in overall Blue Diamond Stakes betting at race sponsor Ladbrokes.com.au is Long Leaf, sired by Fastnet Rock who Catchy is also a progeny of. A winner of all three of his career stats to date, Long Leaf currently pays $6.50 after firming in from $7 to make it four-from-four in Saturday’s elite level. He has been kept fresh not having raced since his Listed Blue Diamond C&G Preview (1000m) win back in late January and that victory has rated well. The last Blue Diamond winner to come off a non-February lead-up was the filly Miracles Of Life back in 2013, but the bookmakers are taking no chances with Long Leaf after his nice barrier seven draw. “Long Leaf makes his own luck having won three out of three and should be right on the back of the pace with cover and hopefully he’s good enough,” Hayes told the media this week. Jockey Kerrin McEvoy comes aboard for the second time after riding Long Leaf to victory last November at Sandown-Hillside in the Listed Merson Cooper Stakes (1000pm) where he beat home subsequent Blue Diamond Fillies Prelude runner-up Oohood. McEvoy chases a third winning ride in the race following his earlier success aboard True Jewels (2010) and more recently the Peter Snowden-trained Sepoy (2011). Blue Diamond Stakes favourites have a strong record in recent years having saluted five times since 2011, most recently with the Mick Price-trained Extreme Choice getting the job done in 2016. The other single-figure quoted Lindsay Park runner is Ennis Hill ($8.50) who is drawn a treat in barrier four, which last produced a Blue Diamond Stakes winner in 2015 with Pride Of Dubai. Like Catchy, Ennis Hill is a Fastnet Rock filly coming off a lead-up win. She saluted on February 3 at the track breaking her maiden status second-up in the Group 3 Chairman’s Stakes (1000m) beating home the boys by one and a half lengths. Ennis Hill now steps-up in grade and distance looking to do the Chairman’s Stakes – Blue Diamond double without a subsequent run for the second time in three years following the aforementioned Extreme Choice (2016). The other chances for last year’s winning stable are unbeaten filly Enbihaar ($20) drawn wide in barrier 19 (into 15) and Qaflia ($26) to be ridden first-up by Dwayne Dunn. Despite the nasty gate, Enbihaar looks to be overs in Ladbrokes Blue Diamond Stakes betting having won both her starts so far including the Group 2 Blue Diamond Fillies prelude (1100m) on February 10. She chases the double Catchy completed last autumn and is out to be the next Blue Diamond winner from barrier 15 since the Snowden-trained filly Earthquake (2014) who also came off a Prelude success. The Tony McEvoy-trained Oohood ($7.50) and the Godolphin-raced Plague Stone, both coming off their respective Blue Diamond Prelude seconds, are considered the dangers in the latest markets.